Liz: The wildlife cam kit has landed. 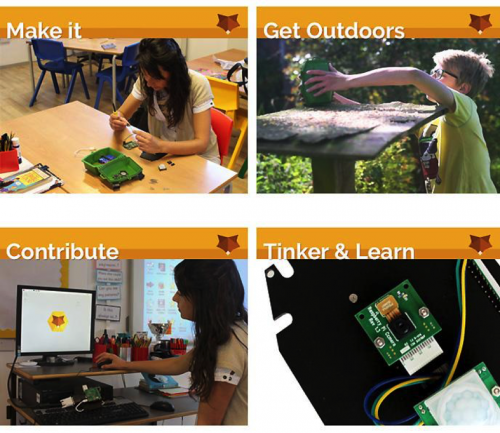 If you’re a regular reader you’ll know we’ve been following the Naturebytes team’s work with great interest; we think there’s massive potential for bringing nature to life for kids and for adults with a bit of smart computing. Digital making for nature is here. Naturebytes is a tiny organisation, but it’s made up of people whose work you’ll recognise if you follow Raspberry Pi projects closely; they’ve worked with bodies like the Horniman Museum, who have corals to examine; and with the Zoological Society of London (ZSL). Pis watching for rhino poachers in Kenya? Pis monitoring penguins in Antarctica? People on the Naturebytes team have worked on those projects, and have a huge amount of experience in wildlife observation with the Pi. They’ve also worked closely with educators and with kids on this Kickstarter offering, making sure that what they’re doing fits perfectly with what nature-lovers want. Today’s guest post is from Naturebytes’ Alasdair Davies. Good luck with the Kickstarter, folks: we’re incredibly excited about the potential of what you’re doing, and we think lots of other people will be too. We made it! (quite literally). 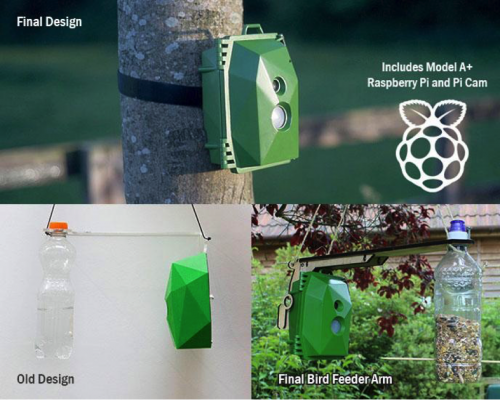 Two years after first being supported by the Raspberry Pi Foundation’s Education Fund and the awesome folk over at Nesta, we finally pressed the big red button and went into orbit by launching the Naturebytes Wildlife Cam Kit – now available via Kickstarter. 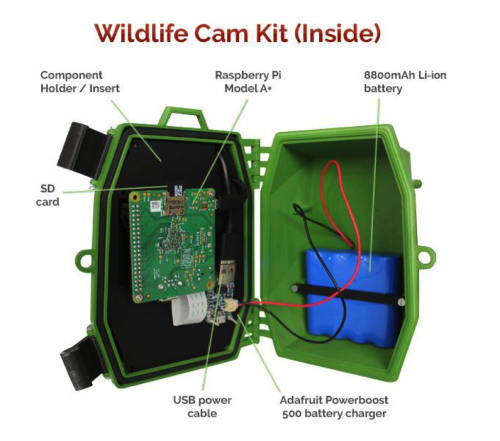 This is the kit that will fuel our digital making for nature vision – a community of Raspberry Pi enthusiasts using the Pi to help monitor, count, and conserve wildlife; and have a hell of a lot of fun learning how to code and hack their cam kits to do so much more – yes, you can even set it up to take chicken selfies. We’ve designed it for a wide range of audiences, whether you’re a beginner, an educator, or a grandma who just wants to capture photos of the bird species in the garden and share them with her grandchildren – there’s something for everyone. This was the final push for the small team of three over at Naturebytes HQ. A few badgers, 2,323 coffees, 24 foxes, and a Real Time Clock later, we signed off the prototype cam kit last week, and are proud of what we’ve achieved thanks to the support of the Raspberry Pi Foundation that assisted us in getting there. We also get the very privileged opportunity of appearing in this follow-up guest blog, and my, how things have changed since our first appearance back in September 2014. We thought we’d take you on a quick tour to show you what we’ve changed on the kit since then, and to share the lessons learnt during our R&D, before ending with a look at some of the creative activities people have suggested the kit be used for. Suggest your own in the comments, and please do share our Kickstarter far and wide so we can get the kits into the hands of as many people as possible. Then and now – the case. Our earlier prototype was slick and thin, with a perspex back. Once we exposed it to the savages of British weather, we soon had to lock down the hatches and toughen up the hinges to create the version you see today. 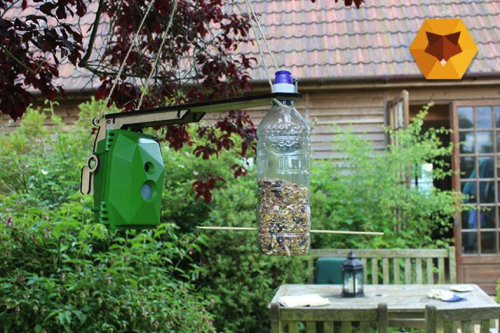 The bird feeder arm was also reinforced and a clip on mechanism added for easy removal – just one of the lessons learnt when trialing and testing. A great deal of our development time has focused on the creation of a useful website back end and resource packs for teacher and educators. For Naturebytes to be a success we knew from the start that we’d need to support teachers wishing to deliver activities, and it’s paramount to us that we get this right. In doing so, we tagged along with the Foundation’s Picademy to understand the needs of teachers and to create resources that will be both helpful and accessible. We’ve always wanted to make it as easy as possible for experienced digital makers to join in, so the necessary 3D print files will now be released as open source assets. For those with their own Pi, Pi cam and custom components, we’ve created a developer’s kit too that contains everything you need to finish a printed version of the cam kit (note – it won’t be waterproof if you 3D print it yourself). 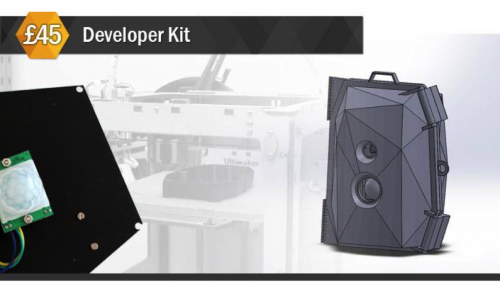 You can get the Developer’s Kit on Kickstarter. Help us develop a fantastic experience for Naturebytes users. We hope to make a GUI and customised Raspbian OS to help users get the most from the cam kit. It’s not much fun if you can’t share your wildlife sightings with others, so we’re looking at how to build an experience on the Pi itself. It will most likely be in the form of a Python GUI that boots at startup with a modified Raspbian OS to theme up the desktop. 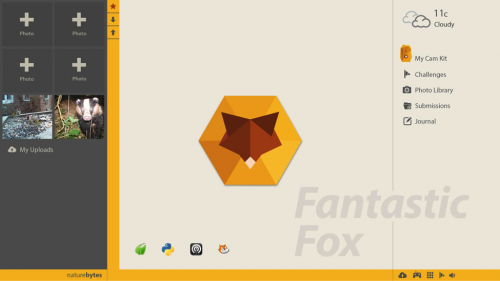 Our end goal is the creation of what we are calling “Fantastic Fox” – a simple-to-use Raspbian OS with pre-loaded software and activities together with a simple interface to submit your photos etc. This will be a community-driven build, so if you want to help with its, development please contact us and we’ll get you on board. We’ll be hosting challenges for the whole community. Join us on a hedgehog hunt (photo hunt!) together with hundreds of others, and upload your sightings for the entire community to see. There will be hacking challenges to see who can keep their cams powered the longest, and even case modification design competitions too. Hook up a WiFi connection and you’ll be able to share your photos on the internet. This means that a school in Washington DC could pair up with a school in Rochdale and swap their photos once a day. An exciting opportunity to connect to other schools globally, and discover wildlife that you thought you may never encounter by peeking into the garden of school a long way away. It’s not just digital making that you can get your hands into. Why not build a garden residence for the species that you most want to attract, and use the camera to monitor if they moved in (or just visited to inspect)? A great family project, fuelled by the excitement of discovering that someone, or something, liked what you build for them. There’s an official Raspberry Pi weather station that we love – in fact, we were one of the early beta testers and have always wanted to incorporate it into Naturebytes. A great activity would be connecting to the weather station to receive a snapshot of data and stamping that on to the JPEG of the photo your camera just created. Then you’ll have an accurate weather reading together with your photo! It’s fantastic to look through a year’s worth of photographic data within 60 seconds. Why not take a look at the species visiting your pond, tree or a wild space near you by setting up a time-lapse and comparing it with other Naturebytes users near you? We’d love to hear your ideas for collaborative projects – please leave a note in the comments if you’ve got something to add! I wonder,is this case totally weather tight? I want to get one of these for my Grand daughter and I also want to incorporate a weather station. But, if it is too air tight, will the weather, humidity, etc. get in properly or do those sensors have to be outside? I really like the idea of the picture with the weather information. Hurry up and release your weather station to the general public. Thank you and keep up the great work! We’ve gone for an injection moulded case to ensure that it’s weatherproof. The weather station idea is a fantastic one and we’re really keen to do exactly that too. Oh, the weather station was aimed at Raspberry Pi. They have done one, but it is limited to current teachers. There was a posting about it a while back, but I have lost track of it. We’ll be selling the weather station to the general public; the schools competition is still ongoing, though, and it won’t be until after that. HOORAY! Will you make an announcement here? Or do I need to keep finding the posting it was mentioned in that it will be sold? > Will you make an announcement here? Hi Homer, yep, the official Rasp Pi weather station is what we’d love to integrate. We were lucky to get an early beta and it’s fantastic! Is there a place to buy ‘just’ the case (for those of us who have the Pi and camera) ? Do you know how the enclosure works in ‘hot’ weather ? If the enclosure is in direct sunlight all day at 90F how hot does the inside get ? Any risk to the hardware inside ? 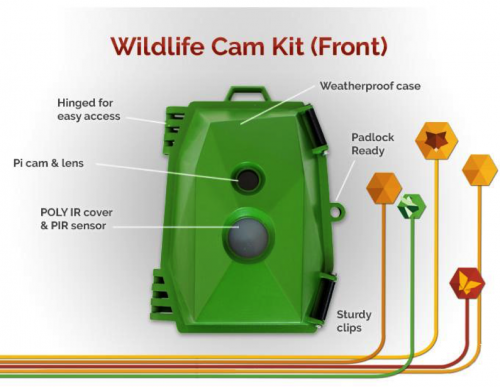 At present we have the Wildlife Cam Kit Lite (no Pi) but we haven’t stocked single cases. You could grab a developers kit (just the internal electronics) and 3D print your own case, however it won’t be weatherproof unlike the injection moulded version. Looks very nice! I thought that outdoor electronic enclosures usually have a tiny “weep hole” at the lowest part where condensation can drip out, as a nominally hermetic case accumulates water due to diurnal pumping effects (air pressure change from ambient temperature) forcing some humid air exchange through imperfect seals. Or is this case truly hermetically sealed? So long as there is a drip hole in the bottom, a few layers of exterior house paint could probably make a 3D printed version water-resistant enough. Thanks. There’s a little rubber grommet you can’t actually see in the bottom (for external access to a vehicle battery or for an ethernet cable so you can power it via PoE). We had some great feedback that it’s possible to prevent condensation on the lense too by using a resistor and a 9v battery to attract moisture away. A nice little trick for the winter months we thought. I think you are missing an opportunity to sell the case only. Many similar bird-table pi projects have been shown in the past using off the shelf parts, but a custom case to hold it all in would be really useful. Great idea Texy & Marcus! We hear you and will look to offer an option post our Kickstarter. We expected that some of our users may have needed replacement cases (wildlife damage etc) if we were successful, but didn’t cater for cases alone in the Kickstarter I’m afriad – opting instead for our “Print your own” Developer’s Kit – which is the cheapest option, or the Lite Kit (no Pi). Only 15 full kits left now! Will this eventually be stocked by RS/Farnell – I don’t mind waiting until November but don’t want to use Kickstarter. Hi Mike. You’ll be able to buy them directly from our website post the Kickstarter. Hi all, please where can I found some tech specification? Looking for camera spec plus if the lens is replacable for different angles and etc. The MagPi issue 35 – next month we’re in print!